Ask us a question. Sign up for Shop newsletter. 9ct Yellow Gold Rings. 18ct Yellow Gold Rings. Rose Gold Wedding Bands. Multi Colour Wedding Rings. 9ct Multi Colour Rings. 18ct Multi Colour Rings. Titanium Multi Colour Rings. Sterling Silver Wedding Bands. 18ct Yellow & White Gold. Two colour 9ct & 18ct. His & Hers Sets. 9ct Gold Earrings & Pendants. Add to Favourite Sellers. Sign up to Newsletter. 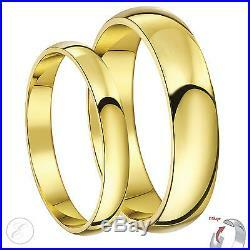 9ct Yellow Gold His & Hers 3mm & 5mm D Shape Wedding Rings&###xA0; &###xA0; Solid & Hallmarked. &###xA0; &###xA0; &###xA0; Ring Details. &###xA0; Sizes Available: &##xA0. &###xA0;9ct Yellow Gold. &###xA0; Approximate Weight: &##xA0. &###xA0;3mm=1.4gr 5mm=2.2gr. &###xA0; UK Hallmark: &##xA0. &###xA0;375 (=9 Carat). Treat yourselves to this fantastic his and hers 9ct&###xA0;yellow gold wedding rings set. These 3mm and 5mm&###xA0;yellow gold wedding rings are lightweight and D shaped for added comfort. At the price that can’t be beat, Elma Jewellery has something for every style, taste and budget! Elma Jewellery is an online jewellery retailer which hosts a full line of wedding bands, engagement rings and other jewellery pieces; most are manufactured within the UK. Subsequent to Elma’s humble founding in 1982, a fusion of quality, glamour and customer service, yet to be surpassed; was established. Over the years, we’ve merited to be instrumental in helping countless people express the unspoken feelings that many special occasions warrant? Be it with regards to family or friends. Today, Elma jewellery has grown and flourished to become a highly successful, leading wedding jewellery retailer, with a collection consisting of the seasons most coveted wedding ring pieces , catering for a diverse base, of discerning men and women. Our mission statement-, to which we have remained staunch over the years, has always been; to supply our customers with an array of perfectly finished wedding bands and engagement rings, alongside an unrivalled customer service, all without the need for costly premises on the high street. Attributed to the latter is the fact that we have the wherewithal to supply YOU’ a potential Elma customer, your dream wedding ring or diamond ring, at discounted prices that will astound you! In addition, our easy-to-navigate website is specifically catered to make your online shopping experience hitch- free! It offers a convenient search filter criteria with which you can narrow down your options and find the perfect item. Also, should you require any further information or advice; our’live help’ will enable you to communicate with one of our experienced advisers who can further assist you. So, what are you waiting for.. ? View our vast collection and your search, for your dream wedding ring will end today? PLEASE NOTE: Most deliveries depending on value of order are sent with signature required post therefore will require a signature.. Please note that we do not dispatch orders on weekends. Please return your item(s) in original packaging and ensure that all packages are securely wrapped. View more great items. This listing is currently undergoing maintenance, we apologise for any inconvenience caused. The item “9ct Yellow Gold His & Hers 3mm & 5mm D Shape Wedding Rings Solid & Hallmarked” is in sale since Thursday, March 22, 2012. This item is in the category “Jewellery & Watches\Fine Jewellery\Fine Rings\Other Rings”. The seller is “elma.jewellery.ltd” and is located in London. This item can be shipped worldwide.